When choosing work boots, it is crucial to find a pair that allows you to get through long work days without feeling pain in your feet. The Thorogood Moc Toe work boots are quickly rising in popularity among workers. The sleek design is attractive and reliable and users find them extremely comfortable for all-day use. This Thorogood Moc Toe review covers the specifications and recommended uses for this product. Here we will highlight key features, what the boots work best for, and how they have helped real users on the job. A Thorogood Moc Toe review collection shows these boots are extremely reliable for toe protection and shock-resistance. These boots can withstand weights up to 50 LBs (22 kg) reaching 117.9J or 2.4-inches per second at impact. In addition to their exceptional toe protection, they are known to provide excellent protection against electrical hazards as well. These boots are produced with electric shock-resisting soles and heels designed to withstand up to 18,000 volts of electricity for up to 1-minute in dry conditions. Thorogood Moc toe boots are designed with Goodyear welt construction and made with full-grain leather for maximum style, comfort, and protection. A Thorogood Moc Toe review shows the fiberglass shank is extremely supportive yet flexible enough to allow users to move their feet around as needed. Construction workers. These boots have great toe protection that is necessary on the job. Warehouse workers. These boots are comfortable and supportive for all-day use. Mechanical engineers. These boots are comfortable and very comfortable to wear. They provide excellent cushioning and appear stylish when meeting with clients. Wide-footed workers. These boots come in wide sizes, so you will have no problem staying comfortable during wear. These boots run true to size and provide ample comfort for both wide and flat-footed individuals. Working in cold conditions. These boots are not insulated, so you may find them unreliable when working outdoors and in cold conditions. Cave workers or workers in wet conditions. These boots are not waterproof, so they will not keep your feet dry when submerged. Additionally, they protect against electrical in dry areas, but the same protection is not provided in wet areas. Several users have freely expressed their satisfaction with these particular work boots. One user’s Thorogood Moc Toe review demonstrates that these boots work extremely well for long days on hard surfaces. This user admits to using several brands of boots, finding the Thorogood to be the most comfortable and durable ones they have found. This individual wears their work boots every day and is very satisfied with the fit. In his opinion, these boots are extremely light and easy-to-wear, which is particularly rare given the steel toe inclusion. The American made boots contain very thin and reliable leather, which works well at preventing cracks and breaks on the surface. Another Thorogood Moc Toe review elaborates on how effective these boots are for all-day wear. This user expressed that these boots felt like they were floating on clouds all day due to their extreme comfort. These boots ensure the user feels no foot or back pain, even after spending hours on his feet. In addition to loving the comfort of the Thorogood Moc Toe boots, this user loved the quality of the leather and that the boots come from the USA. Having proper work boots is extremely important, especially when working in harsh and dangerous conditions. When it comes to choosing ideal work boots, safety needs to be a priority. There are thousands of work-related injuries each year, with the majority of them associated with falls and slips. It is important that the soles of the boots are slip resistant in order to protect you in slippery areas. After focusing on safety, workers need to focus on what they need in the boot. There are numerous features work boots offer, each targeting different industries. Individuals working with electricity need to have protection against electrical wires and shocks. If you are working with heavy items and equipment, adequate toe and foot protection is crucial. Moreover, if you are standing on your feet all day, it is important that your boots are comfortable. If you have to change position often and move around a lot, you need to find a boot that provides this type of flexibility. 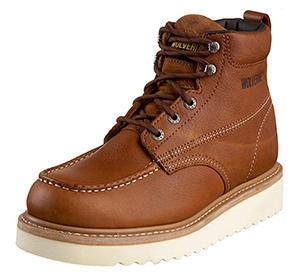 Overall, the Thorogood Moc Toe 6″ Work Boot is a solid choice for workers. This boot has excellent toe protection, flexible and reliable shank support, and the soles are strong and slip resistant. These boots are exceptional and the leather is attractive and reliable. This is a great choice for individuals working in tough conditions, working with electrical, and those who have to move heavy items or use heavy equipment daily.